The Federated Glass Company was formed in Point Marion, Pennsylvania in 1902. It was the predecessor to the more well known Houze Glass Company. The Federated Glass Company was know for making window glass. Leon Houze (president and general manager of Federated Glass)who was known for his advancements in furnace design, also perfected methods for manufacturing of colored sheet glass. In 1914, Leon J. Houze and his son Roger J. Houze filed a patent for a method of making and tempering convex glass articles. At this point in history the company became known as the L.J. Houze Convex Glass Company. With this invention the company made camera lenses and glass for goggles. The newly patented convex glass allowed the company to become the main provider of glass goggles for the military in World War 1. Houze was able to aquire 75% of the market share for miltary lenses. The factory continued to grow and as they did they experimented with different types of glassware. The L.J Houze Covex Glass Company began making MarbleX and Onxglas in 1928 under the trade name of HouzeX. MarbleX glass is a marbleized glass with a mix of one or more colors. Many people refer to this type of glass today as slag glass. Onyxglas is a translucent solid colored glassware that is sometimes called colored clambroth (See the list of translucent colors below). These are the years that Depression Glass enthusiasts are most concerned with. During this time the L.J. Convex Glass Company made many of our collectible marbelized glass items. They experimented with color as well and many shades of transparent and translucent glassware can be found from this time period. In addition to slag colors other colors known to have been made by Houze include amber, black, crystal, cobalt, green, ruby, peacock blue, light blue, pink, vaseline transulcent jade (jade clambroth), translucent lavender, translucent yellow, translucent blue and translucent moonstone. Houze used this colored glassware to produce a large number of ashtrays, flower pots, and candlesticks. These items were often sold to other companies who distributed them under their company name. Houze was the number one maker of accessory items for automobiles. They made colorful car vases, ashtrays, and gear shift knobs. The ashtrays and vases were attached to the cars with metal chrome plated fixtures or with plastic suction cups. These items were made in pretty slag colors as well as in some of the transparent colors. Another large line produced by Houze was that of small bedroom, table, and floor lamps. 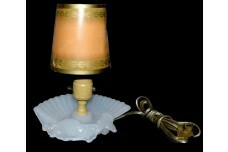 Today many Houze lamps are found in Antique and Flea markets so this must have been one of Houze's largest concerns. We have had numerous lamps with the original HouzeX label still intact. Most of the lamps found are either marbleized or translucent in color. Bathroom articles such as cup holders, toothbrush holders, razor horns, towel bar holders, and powder jars were made in almost every color of the rainbow, including slag glass. Ink blotters, pen holders, smoking stands, ashtrays, beater bottoms, a console bowl, and numerous candlesticks were also items known to have been made during this time period. One of the most interesting items to have been produced was a boxed child's set that can be found in translucent blue, jade and yellow. These sets have been found in original boxes confirming the maker. Houze was most certainly a major contender of accessory items during the Depression Era. From 1949 until 1953 sheet glass was the Houze's main production item. At this time they became the major manufactor of sun glass lenses. They learned to use screen printing (a process which allowed them to transfer photographs to glassware with permanently fired on ceramic colors) . This process was used to make many items for souvenir and advertising purposes. By the late 1960s The Houze Glass Corporation turned from making glassware to buying blanks and concentrating on decoration. Houze became one of the largest specialty advertising firms. They offered many advertising decorations on ceramic mugs and glassware. While The Houze Glass Coporation was one of the most enduring companies to have been created, lasting for over a century, the decline in demand for glassware and ceramics and the rising costs of operation caused the plant to close its doors in December of 2004.